I can feel the excitement begin to build! Another reading is coming up at the Cornelia Street Café, and I can hardly wait. I’ll be reading on Wednesday, January 25th (less than two weeks away!) with Laura Spence-Ash, and if you’re free that evening for an hour or so, come on by to this all-fiction post-inauguration-weekend respite. You will need a respite, won’t you? And bring some friends, if you’d like. I’m pretty sure you’ll enjoy it! I first became acquainted with Laura through her very fine work in One Story magazine a couple of years ago. Then, after meeting her at a g athering, I learned that she had also been to Sirenland, that magical writing workshop in Positano, Italy that I attended in 2011. She is indeed a talent, and I am happy to be sharing the stage with her very soon. I’ll be reading short pieces from three works, first from Problems of Translation, the novel I published in April of 2015, which is becoming a hit in certain circles. (Among the 100 notable books of that year by one measure, its full title is Problems of Translation, or Charlie’s Comic, Terrifying, Romantic, Loopy Round-the-World Journey in Search of Linguistic Happiness.) Plus, there’ll be a piece from the not-yet-published novel I just completed, called The Condor’s Shadow. But wait, there’s more! As a bonus treat, there’ll be the first couple of pages of a short story I began only very recently–yielding a shocking glimpse, perhaps, into one writer’s mind, and how it (sometimes) works! Some of my excitement stems from what Laura will be reading, which will be a surprise to me, and I’m eager to hear it. In addition to the wonderful short story mentioned above, Laura is currently working on a novel (unnamed as yet) and a collection of linked stories (ditto; she keeps her cards close to her vest). Besides that, she writes for the very well-known and respected journal Ploughshares a blog called “Fiction Responding to Fiction,” where she reveals insights into important writers’ literary relationships, two at a time. Amy Hempel and Grace Paley, for example. Or John Cheever and Raymond Carver. Or Flannery O’Conner and Alice Munro. Exciting stuff, so Laura Spence-Ash is herself a writer to watch. 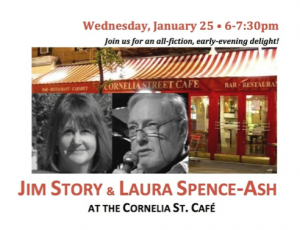 So please come if you can to the Cornelia Street Café on Wednesday, January 25, from 6-7:30 pm to enjoy our program of good reading and listening. It’s at 29 Cornelia Street in the Village (between Bleecker & West 4th), and the Café’s cover is only $10 (cheap enough when you consider you get a free drink along with the reading)! Further details are available at corneliastreetcafe.com. Dress warm, but with any luck, you won’t even need snowshoes! This entry was posted in More About Jim, On Writing, Problems of Translation -- A Novel, Publications, Readings & Events and tagged 100 notable books, Cornelia Street Cafe, free drink, novel, Ploughshares, Positano, Problems of Translation, short story, Sirenland, The Condor's Shadow. Bookmark the permalink.